Flood & Fire Emergency Reconstruction Experts. Our operations team lead and project coordinators handle the details of every project, including daily field scheduling and emergency dispatch activities. A project manager is assigned to effectively manage emergencies and project reconstruction processes. During the emergency or reconstruction of any project we use technologies to keep the entire team in sync. An emergency project manager is assigned to be on-call during office after hours ready to provide sound solutions to any building emergency, or reconstruction project. We are to attend every call with the same level of urgency, courteousness, and diligence. Our duty is to serve our clients to a high standard of excellence throughout the entire process. At Incredible, we have been around for 22 years serving our community, maintaining long standing relationships with insurance companies across Canada. 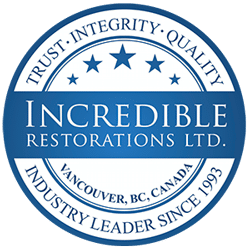 Our focused efforts of consistently delivering excellence in the market place, has helped Incredible be recognized as a premium provider of the property restoration services industry in Vancouver’s lower mainland. We provide prompt detailed reporting, estimations, expert advise and direct filing to insurance companies, strata councils, and homeowners. It’s our duty, obligation and responsibility to successfully bring your property to pre-loss condition, with a smile on your face. Our team has embodied the brand and live by the name “Incredible” — our culture is built on trust, high energy, and customer care. Closing an emergency or reconstruction project requires attention to detail from day-1’s site protection, to rebuild, to invoicing, to customer certificate of satisfaction (sign-off). Our operations management team, support staff, and field technicians are guaranteed to make you part of a wonderful experience.